Wishbone Day: Wishbone Day Vietnam - Heads-up Asia! On Monday 14 November 2012, CLAN partnered with the National Hospital of Pediatrics (NHP) in Hanoi, Children's Hospital Westmead (CHW in Sydney, Australia), Wishbone Day and other key partners to support the launch of Vietnam's Inaugural Osteogenesis Imperfecta (OI) Club. There are about 120 children who present to NHP for management of OI, and this Club will bring them together as a community, and learn more from them about the best ways to ensure the children enjoy the highest quality of life possible. 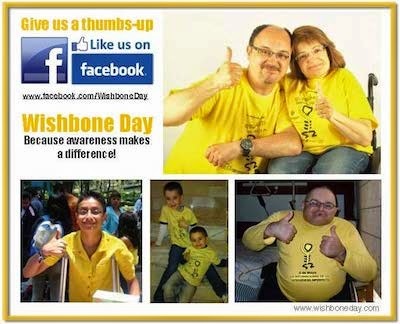 In 2013 the Vietnamese OI Community joined their international neighbours to celebrate the fantastic network of Wishbone Day. We're excited and proud that the Vietnamese community is a genuine part of our global celebration.